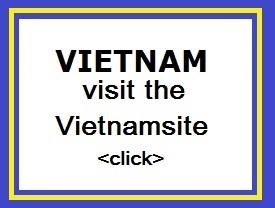 "Phnom Penh, once known as the �Pearl of Asia�, is a bustling business and cultural hub of Cambodia. The streets are numbered, making it easy for me to explore the place on foot with the help of a map. �Hello, lady! You want tuk-tuk/ moto?�, called out tuk-tuk and moto (motorcycle taxi) drivers after every few meters, eager to strike a deal for a city tour with me. I sprained my neck muscles, shaking my head from left to right in disapproval, always getting a big smile in return." A mixture of Asian exotica, the famous Cambodian hospitality awaits the visitors to the capital of the Kingdom of Cambodia. 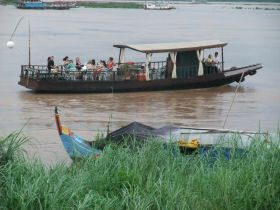 The city is situated at the confluence of three great rivers the "four arms" of the Mekong, Tonl� Sap and Bassac. They are forming the "four arms" right in front of the Royal Palace. 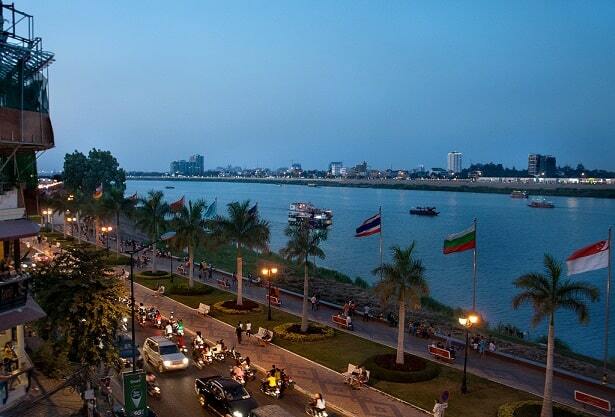 Phnom Penh has been the national capital since French colonization of Cambodia, and has grown to become the nation's center of economic and industrial activities, as well as the center of security, politics, cultural heritage, and diplomacy of Cambodia. 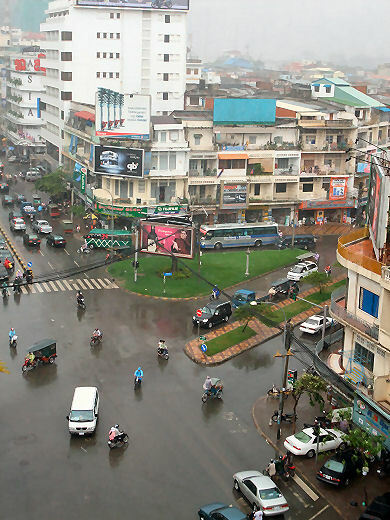 The city is the wealthiest and most populous city in Cambodia and is the country's political hub. Phnom Penh is the commercial, political and cultural hubs of the Kingdom and is home to over one million of the country's estimated 15 million people. It is also the gateway to an exotic land�. the world heritage site, the largest religious complex in the world, the temples of Angkor in the west, the beaches of the southern coast and the ethnic minorities of the north-eastern provinces. The city was founded in 1434, the city is noted for its beautiful and historical architecture and attractions. There are a number of surviving French colonial buildings scattered along the grand boulevards. The city offers several cultural and historical attractions including the Royal Palace, Silver Pagoda and the National Museum. There are also a wide variety of services including five star hotels and budget guest houses, fine international dining, sidewalk noodle shops, neighbourhood pubs international discos and more. Phnom Penh, like other Asian-City tourist destinations, is in the midst of rapid change. Over the past few years the number of restaurants and hotels have grown considerably and in the last year there had been a huge increase in the number of visitors. There are now direct daily flights from several Asian cities and three overland border crossing have opened since 1998. Even travel within the country is easier with several airlines flying domestic routes, regular bus service to major cities like Sihanoukville and Kampong Cham and road conditions throughout the country have been gradually improving. Cambodia is becoming easier to visit everyday. With booming economic growth seen since the 1990s, new shops have opened as well as western-style malls such as Sorya Shopping Center and the new Sovanna Shopping Center. Two international franchises have also opened up in Phnom Penh. Dairy Queen has already opened up inside Phnom Penh International Airport and Kentucky Fried Chicken (KFC) has opened up a restaurant on Monivong Boulevard and plans to open more soon. The same company that opened up KFC in Cambodia has now obtained franchise rights to bring Pizza Hut to the country. In addition, a Swensen's ice cream restaurant has opened in Sorya Shopping Center. You can browse the city�s markets for a bargain or you can linger in the beautiful boutiques that are putting Phnom Penh on the style map. Go street-surfing through the local stalls for a snack or enjoy the refined surrounds of a designer restaurant. Shopping is perhaps the best thing to devote time to besides sightseeing. Cambodian fine silk pieces and textile materials are world renown. Moreover, Cambodia is a treasure trove for sculptures, carvings, silverwork and paintings. There are just so many things to shop for in Cambodia. Phnom Penh�s new Night Market on the riverfront is aimed squarely at visitors and tourists, offering a wide and varied selection of Cambodian handicrafts silks, art, curios and souvenirs. The atmosphere offers a much more relaxing retail experience than a typical local market. With a festive vibe and items to please young and old, foreigner and local, the night market appears to be a promising addition to the city�s shopping scene (5pm to midnight, Fridays, Saturdays & Sundays). Dining � Phnom Penh offers a great range of local and international cuisine. As with surrounding countries, traditional Cambodian cuisine offers a choice of delicious rice dishes, noodle dishes, stir fries and curries at rock bottom prices. Enter a local eatery and you can expect to get well fed for about a dollar. The French influence can still be seen in Phnom Penh with plenty of French restaurants dotted around the city. Chinese food is also popular, while modern development has brought with it pizzerias, steak houses and other international fare. Sisowath Quay is a good place to find a range of quality restaurants and eateries. 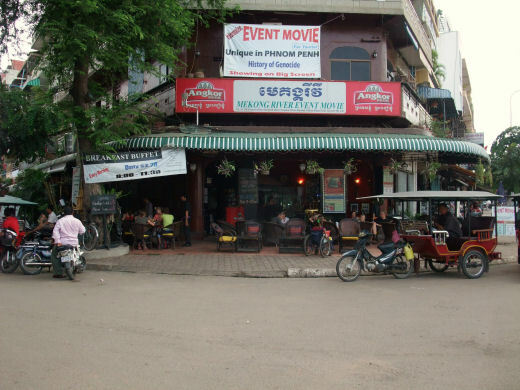 Nightlife � There is no shortage of nightlife in Phnom Penh with plenty of shows, bars and clubs. If you want some culture, you could check out shadow puppetry at SovannaPhum or films and screenings of all sorts at Meta House. There are bars aplenty along the riverfront for a beer or cocktail, while some of the less reputable establishments on Street 104 and street 136 stay open until the early hours. "Phnom Penh does not have a lot of green space but there are parks and my favourite is the Vietnamese Cambodian Friendship Park. During the day it is generally deserted because it is so open and hot but it comes alive in the late afternoon and night. It just fills up with people and there are soccer games and lots of families and then aerobic dancing. For 1000 riel you can join a group and try to keep in step. The leader wears a head set and counts off time over the music which is incredibly loud. Really fun to watch and join in. Cambodians love to dance and sing and wear bright clothing. So strange that the Khmer Rouge made everyone wear black pyjamas and singing and dancing was banned. As it gets dark the fountains light up and it is really pretty."